We greet you with love and joy on this Holy Feast of the Presentation of our Lord and God and Savior Jesus Christ into the Temple. The verse from the Great Vespers of the holy feast which is quoted above transmits to us the essence of this holy feast. 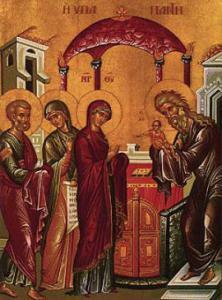 The law is fulfilled by the presentation of our Lord into the Temple at 40 days after His birth. The pious Simeon, who has waited patiently for the revelation which has been promised to him by God, expresses his joy in no uncertain terms. He is awestruck by the thought that he now bears in his arms the Creator of the universe, and he expresses his readiness to depart this life having been blessed by this experience. This holy feast is also called the Meeting of the Lord in order to emphasize that the righteous Simeon now meets his Creator face to face, and holds Him in his arms. That which has been promised by God to Simeon is now fulfilled. As the righteous Simeon now meets his Lord in the Temple, let us also meet the Lord in our lives so that we can bear witness and exclaim that we too may “depart in peace” having directly encountered our Lord and God and Savior Jesus Christ.